We all watched breathlessly when the train tracks flooded and 3,500 people were stranded up at Machu Picchu. Since then we haven’t heard much about the site other than it was closed for repairs. On April 1st Susan Sarandon helped to reopen the site to tourists. Can you tell me what has changed? On 29th March, Ferrocarril Transandino S.A. (FTSA), the concessionaire of the railway tracks for the South ad South Eastern of Peru, ended the rehabilitation works of the tracks between Piscacucho town (km.82) and Aguas Calientes (km.110 Since then, Perurail is operating its train services Backpacker and Vistadome, in that route (see the map below) In Piscacucho, Perurail has improvised a temporary train station. FTSA calculates that will be finishing all the rehabilitation of the railway tracks by 1st July. If that happens, since that date the train operators will be suitable to operate from the Poroy (km.18) and Ollantaytambo (km.68) stations. Since 1st April, Perurail is transporting about 2000 to 3000 passengers each day. Are all of the PeruRail trains (the Backpacker, Vistadome & Hiram Bingham) running again? By the moment, only the Backpackers and Vistadome are operating. The Hiram Bingham train will be able to operate since 1st July approx, because it´s wagons are ubicated in the Poroy station (km.18) and in order to move them, first its necessary that FTSA repairs km.79, were the mayor destruction occurred during the floods of January, so the Hiram Bigham train can pass towards Aguas Calientes. After the flooding the Peru tourism bureau said they would be running specials. I have seen airfare deals from the United States. Any specials within Peru to encourage tourism? The hotels of the Orient-Express collection in Peru had made special deals to incentive, during the period that Machu Picchu Citadel was closed, Peruvians to visit Cusco. Also Perurail and the Orient-Express Hotels are supporting the programs of incentive launched by Promperu, and also inviting press to cover the different attractions in Cusco, in order to promote the destination. I read there was some landslide damage at Machu Picchu. Has this been repaired or is work still on going to restore it? All the damages in Machupicchu town are almost repaired. The tourist routes are working without problem again. But the Citadel was never damaged by the floods. Orient-Express owns the only hotel on the actual site, The 31-room Sanctuary Lodge. How did your staff handle the crisis? Were Orient-Express guests allowed to stay over until help arrived? Were you able to take in any other stranded travelers? On Tuesday 26th January, two days after Machu Picchu town was isolated due to heavy rains that struck the entire region of Cusco, Peru, 210 weary walkers emerged at Machu Picchu’s Sun Gate having completed their three day hike along the Inca trail. Finding themselves unable to leave Machu Picchu due to the damage this natural disaster had caused to the railway tracks, these walkers were offered welcome food and shelter at the Machu Picchu Sanctuary Lodge. Of these 210 people, 50 were local guides and porters, who work carrying provisions and tents for the hikers, and the rest were tourists of different nationalities – Argentines, Brazilians, Colombians, Chileans, Australians, Danish, Americans and British. Gustavo de Leon, General Manager, welcomed everyone into the hotel with open arms and each was offered a warm lunch of chaufa rice, a traditional Peruvian dish of Chinese inspiration. Throughout the afternoon, the staff of Machu Picchu Sanctuary Lodge transformed the Tinkuy buffet restaurant into a dormitory, so that all 210 people could set out their sleeping bags for the night, after having a simple buffet dinner. This group of Inca Trail adventurers remained at the Sanctuary Lodge for five days in total, before they were able to be evacuated by helicopter. In what was a tiring and uncertain time, these guests were offered access to the Internet so that they could communicate with their families, friends and embassies. The hotel also made available its phones so that they could receive calls from relatives. At the time of the floods, the 31 room Machu Picchu Sanctuary Lodge also had a further 45 resident guests, who were also treated with the same hospitality that characterises Orient-Express around the world…even in hard times! Any lessons learned from the flooding? Any changes to policy or advice you now give your travelers before they make the trip? The floods occurred in Cusco last January, were not predictable in that intensity. It was a completely abnormal increase of volume of the Vilcanota river. The waters reached the historic highest of 1,100 cubic meters per second due to 3 days of heavy rains, while the record was at 820 cubic metres/sec for a few hours. According to the weather authorities, at the Cusco region it rained in 3 days the equivalent of a month. There are no registers in the almost 90 years of the railroad going to Machupicchu, of these volumes of the river. But FTSA is now building retaining walls and defenses along the railway tracks, in order to protect them better against similar events in the future. Were people allowed to stay at the Sanctuary Lodge while Machu Picchu was shut down? If not, how did you keep your staff busy until the reopening of the site? No. Our staff has the opportunity to make a full maintenance of the property which now looks better than ever! Were any of your other properties affected by the floods? Is the Inca Trail reopened to foot traffic yet? Will it reopen? 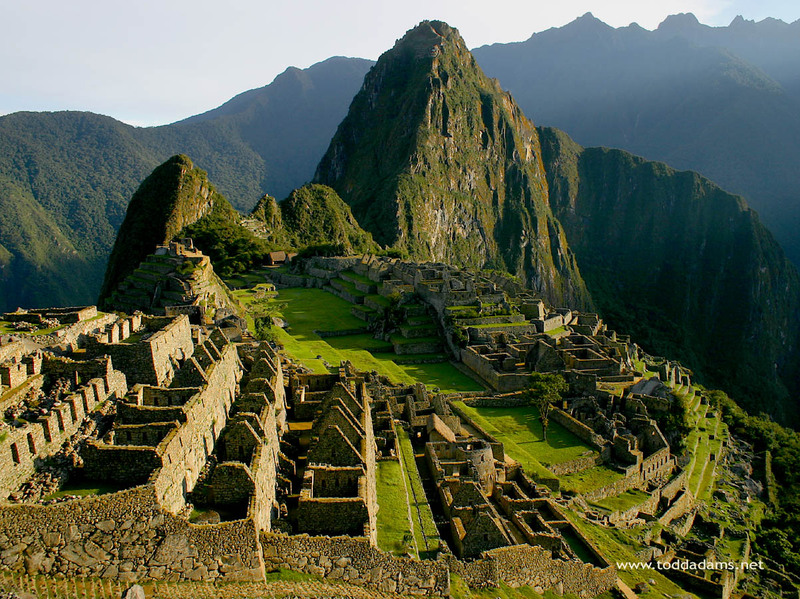 The Inca Trail is managed by the National Institute of Culture, and yes; it´s reopened again since 1st April. Thanks to both Roxana and Catherine for taking the time to talk with Instant Native Travel. If you find yourself in Peru be sure to check out the Orient-Express Hotels at Cusco and Machu Picchu. Ecuador is one of the most ecologically diverse countries in the world. Yet for many people it’s still a “stealth” destination. What would you say draws people to your country? What, in your opinion, is the best reason to come? Ecuador has still very little tourism compared to Costa Rica or Peru. But there is a lot more to discover than just the nature, we have interesting people, spectacular scenery, and a lot of culture and of course an excellent gastronomy. I found you via your website. I was intrigued by your rose tour. It wasn’t the typical Ecuadorian sampler tour. What inspired you to create such an unusual tour? Ecuador is one of the largest flower producers in the world, do you know the most of the cut flowers sold in the U.S are grown in Ecuador? Because, the highlands of Ecuador have a spring like climate all year-round, flowers grow permanently, that means most of them are in bloom twelve months a year.This was one of the reasons to organize a special Garden & Flower Tour. Many of the foreigners I met in Ecuador spent a day or two in Quito before heading to the Galapagos. As a native, if you were recommending sights for friends where would you send them? I would take them to the churches like La Compañia or the San Francisco Monastery in the Colonial Old-town of Quito and to the Intiñan Museum at the Middle of the World (Ecuadorian Line). *There is of course much more to see like for example: On a nice morning doing a cable car journey up to Cruz Loma, or visiting a large vegetable and fruit market in the Historical Old Town of Quito, where my friends can see and taste exotic fruits and vegetables they have never seen before in their lives. *Visit a traditional Coffee Roasting facility in the Old Town of Quito where my friends can taste various kinds of coffee and then drink a typical CORTADO in a traditional Coffee Bar. Mariscal Sucre. What’s your take on “Gringolandia”? Tourist paradise or tourist trap? Is a nice place to meet with locals, there are many good restaurants and sometimes after a heavy time traveling around Ecuador, it is a place to be back to the civilization and join and have fun. Quito has over 40 amazing churches. Which is your favorite? Of course La Compania and San Francisco are probably the nicest and most visited. But also for example San Agustin is very interesting, because a lot of Ecuadorian and Southamerican History took place inside San Agustin Monastery. Another very interesting place is the Cloister of San Diego, this is one of the most authentic sites in the old town of Quito. In San Diego are still nuns living and the place gives one of the best impressions of cloister life in Ecuador. Not to forget when you visit San Diego is to visit the cemetery of San Diego next door with its monuments and mausoleums and with a little bit luck you can talk and perhaps meet phantoms there. Your calendar this year shows a lot of different types of tours; volcano horseback riding in the Andes, mountain climbing, flower tours and of course my favorite, your “Sweets of the Gods” tour in Quito. Do you have one that you are especially looking forward too? Coffee Harvest Tour which we offer during the coffee harvest season from May to July. Spectacular landscapes far a way from civilization and a lot of contacts to local people for the participants. I see that you have Honeymoon destinations to your site. What is your #1 recommendation for a romantic getaway in Ecuador? We have two similar interesting options: The first one is traveling from Colonial Hacienda to Colonial Hacienda, on this tour the couple is treated as a King and Queen. You understand that this option is not the cheapest one. The second option is something very special, spending Honeymoon in the Amazon Rainforest together with many exotic animals and plants and not to forget exotic locals who make this experience an unforgettable one for the couple. The couple from the Western civilization meets the Jungle in all its colors and savours. There are a lot of people, me included, who believe you have one of the greatest jobs in the world. Any special challenges you have to meet? What’s the hard part of being an expert guide? You need a lot of improvisation skills, because a lot of issues cannot be foreseen, like for example: land slights that make a route impossible to pass or suppliers who don’t have a watch to be on time, cellphones without coverage to do an important phone call, etc. Huge thanks to Sebastian for stopping by Instant Native to chat with me. If you’re heading to Ecuador, be sure to check out his websites. I’m sure you’ll find an original and unique tour to capture your imagination! You and your husband Scott conceived the idea for Pack for a Purpose on safari. How did you manage to take it from the light bulb stage to reality? The idea is deceptively simple, but as you say has a big impact. I’m curious how you made it happen. First I discussed the idea with as many friends and acquaintances as possible so I could assess the idea. I received 100% support for the idea. Since my tag line reads “Only spreads sheets on beds, thinks blackberries are for cobblers and believes text is found in a book”, I knew I would need help to make my idea into a website! I contacted generous and highly skilled friends who were willing to donate their time to make Pack for a Purpose a reality. I cannot express enough how important a community of caring friends was to make this happen. What is the most rewarding thing you’ve donated to date? While it is always extremely rewarding to see children’s faces light up when they are playing soccer with an actual ball instead of a pile of rags, or using a ruler in a class where there had been none previously, we would have to say that being able to provide a clinic with its first stethoscope gave us a special sense of accomplishment. How do the kids react to your donations? When you delivered those first soccer balls were they wary? Surprised? Delighted? Within five minutes of receiving the soccer balls, with their teacher’s permission, they were playing a game on a dirt field with unbridled joy. You include a card with all donations saying, “This package from _______ was made possible by finding your needs list on the Pack for a Purpose website. It is our pleasure to be of help.” This is brilliant because it let’s the people know your donation is designed to fit a specific need. Whose idea was this? Once again, it was another fantastic friend, Eric Goldberg, who came up with the idea. We ran into each other while walking the mall on a rainy day. We started discussing the website and Eric asked “How will people know where the supplies are coming from?” “I haven’t thought about that,” was my reply. Eric immediately suggested a printable card and our amazing web designer, Erik Macenas, had it up on the website that evening. My greatest good fortune is having terrific friends. You publish “success stories” on the website. Have you found that word of mouth is helping to create a buzz around your efforts? Word of mouth is certainly helpful as well as articles in blogs like yours. Having people become a fan on Face book, which they can do on our home page, is a great way of assisting with the buzz. Were you surprised when ABCNews.com contacted you about Pack for a Purpose? What is your dream interview? Not really Anne. A dear friend of mine who lives in Italy is actually married to the reporter who wrote the article. I sent her information about the website in progress in September because she had friends in Kenya who run a Camp. I wanted her to let them know about our idea to see if they wanted to have their Camp and Project on our site. I got an immediate email back from her husband Clark who thought it was a wonderful concept and said he would like to do a small story on it. I asked him to wait until the website was actually up which he agreed to do. Having a good idea and connected friends who believe in it is a wonderful combination. My dream interview is a toss up between Dianne Sawyer and Oprah, but really every interview that helps get the word out is a gift. Want to know more about Rebecca or Pack for a Purpose? Visit their website and check out their new brochure. You can also follow her on Twitter and Facebook. Me, I’ve got my fingers crossed that Oprah’s staff picks this up and invites them on to tell their exceptional story. Lara Dunston, who writes the Cool Travel Guide, is a self described “perpetual globetrotter”, and the author of over 30 travel guides. She and her talented photographer husband Terry Carter have published numerous articles in newspapers and magazines as well. I recently read her Dubai City guide, and found I really liked the way she was able to enfold me in the culture and feel of the place. Lara is smart, funny, effortlessly cool, and as exotic as the foreign lands she writes about. She’s also a guide who’ll tell you how she truly feels about the places she’s been, good and bad. My favorite post? A clever little blurb over at Charles & Marie on how her luggage is surviving. Being a travel writer is hard work. You’ve been on the road for over two years now. What is the best part of your job? You’re right, it’s really hard work: minimum 12 hour days, 7 days a week, 365 days a year. But I’m working in all these amazing places all over the world, so who’s going to listen to me complain? The best part? Having the freedom to go somewhere at a moment’s notice; getting to spend a lot of time in one place to really get to know a destination (we’ve rented apartments for months in Amsterdam, Brussels, Buenos Aires, and they were magical experiences); and being able to work in my underwear or drink a glass of wine as I write a story, if I so please! You’ve contributed to more than 30 guidebooks. How do you choose the places you write about? Are they assigned or do you get to choose your destinations? I’ve written most of those with my husband, and many were first editions, so that means writing them from scratch. There are several ways the projects have come about: in some cases commissioning editors have phoned and asked us to write a book, in other cases I’ve pitched for titles publishers have had on their schedule and got assigned them, and then I’ve also submitted proposals to publishers and persuaded them to commission us to write a book. We choose some destinations, in that we say, okay, let’s try and get a book in Buenos Aires, while other places have not been on our radar at all, like Cyprus and Crete, where we just spent a couple of months. Does my Mac PowerBook G4 count? I guess that’s an essential rather than an accessory! I don’t go anywhere without it. There are a few must-haves: an iPOD of course, plus our Apple Airport Express, so we can set up our own wireless internet, a network to share files, and play our own music from our laptops, and my Motorola RAZR phone, which I love. I don’t have anything as extravagant as slippers I’m afraid – I don’t have room for more than 4 pairs of shoes (black leather knee high boots, which I wear every day in winter, leather flip flops for summer, good trekking boots, and glam pair of high heels). What is your favorite place that you’ve visited? I labour over this question because I don’t have one particular favorite destination. I love so many places. But I could give you a top ten: Madrid, San Sebastian, Barcelona, Venice, Essaouira, Marrakesh, Damascus, Beirut, Dubai, Buenos Aires, Mexico City, Havana, Rio de Janeiro, Antwerp, Zurich, Venice, Milan, St Petersburg, Moscow, and Istanbul. But, gosh, that’s 20, better make it a top 20! Aya Napa in Cyprus, Benidorm in Spain, Oludeniz in Turkey, those kinds of places where you see menus in six different languages, ‘English breakfasts’ on the menu, and Irish pubs – destinations that have been over-ran by package tourists and ex-pat property-buyers so much so that they’ve changed the very nature and culture of the places. You’ve written about being an “instant native”. What does that mean to you personally? I write a bit on my blog from time to time about ‘living like a local’ and becoming an instant native – to me that means going to a place and staying a while, renting an apartment rather than staying in a hotel, getting away from the tourist areas and off the beaten track, learning the language (even if it’s just the basics), learning how to cook the local cuisine or dance their national dance, shopping in the local markets, watching a football match, and just generally doing activities that locals do – in some cases you can learn more about a culture going to a shopping mall and buying your groceries in a supermarket with the locals or going to the cinema and watching a movie and seeing how they react and interact, than you do visiting a museum. Some people find it hard to do this though, especially people who haven’t traveled much outside their own country or culture, which is why I think the service you provide is amazing. It provides people with guidance and help so they can more quickly get acquainted with a place and get the most enriching experience they can from a destination. When you have a travel snafu, how do you handle it? Politely, confidently, reasonably, and forcefully. If an airline has bumped us off a flight or a hotel has lost my booking, I won’t let it go. There are always ways around things, but sometimes you have to find the solution yourself and make the suggestion. You need to see how the locals around you are dealing with things and adapt your behavior to suit. For instance, rudeness will get you nowhere in Australia where anyone in any kind of uniform thinks they are a policeman, while being polite is a mistake in Egypt. What travel resource can’t you live without? A good map, dictionary, and phrase book for the country I’m visiting – they’re the first three things I always buy. Do you recommend people use a guide book on vacation? They have less of a need for one if they’re using a concierge service like yours. If they want to travel light they’ll be fine with a good map, phrase book, some confidence (to ask locals for advice), and a couple of good books on the destination, such as an engaging read on the history, culture or politics of the place, and a memoir of a travel writer who has been there before. Whenever we arrive somewhere new, one of the first things we do is find a good bookstore and pick up a few books by local writers, a novel and some short stories usually – that way you get a real local insight into the contemporary culture. You can’t go wrong with a DK Eyewitness guide, which also has good walks and their photography allows you to get an idea of what a place will look like which helps you to make a decision as to whether to go there or not. The slim DK Top Tens are terrific for short breaks, as are Lonely Planet’s little Encounters. Given your vast travel experience, is there a travel tip you can share with us? Learn the ten language basics of the country you’re going to while you’re on the plane (hello, how are you? good thanks, yes, no, right, left, excuse me, thank you, and goodbye). You’ll be amazed at what a difference it makes to your experience of a place and how locals treat you.